Before you grab this book eager to dance Roman-inspired steps of trance magic, you need to know the following: first, Ecstasia is created as a way of building upon the Nova Roma neopagan reconstructionist religion and is definitely anchored in a Roman context. Second, this anchoring as a Roman reference may here and there results in a few archaic concepts. Third, when it comes to dance practice, Julia Zay knows what she’s doing. The steps are the invention of Zay based on archetypes common in ancient Rome. This particular form of trance-dancing is used by celebrants of Nova Roma and the terms, archetypes and sometimes arbitrary rules all have an ancient Roman/Latin context. Zay also gives suggestions for cultivating musicians for ritual work, an area much needed and much neglected by other authors involved in participatory rites. While her perspective on trance music is a bit different, that it’s discussed at all is a valuable addition to the pool of ritualistic knowledge. 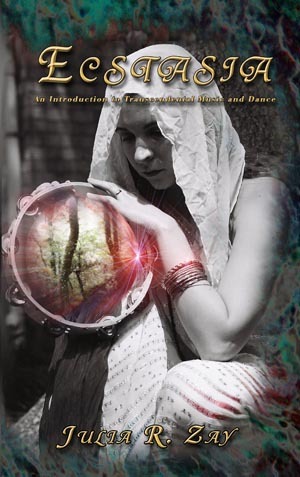 While not a first choice book on trance and ecstatic ritual, this book certainly should go to anyone who wants to build expertise on the subject. The rarity of Nova Roma published materials alone makes it worthy of addition to a broad library.